Being open about money and having positive conversations about it in everyday life is key. Only 52% of parents talk to their kids about money matters, but if we shield our kids from some of the realities of money, we’re only delaying their learning process. Use everyday examples to spark the conversation, whether it’s why you’re turning the lights off at home, where the money in the ATM is coming from, or what to do with that fiver your grandad just gave you. If you’re eating out on holiday, playing ‘guess the bill’ can be an interesting insight into their perception of what things cost – and if your kids really want to show off, get them to guess the cost against the exchange rate! The holidays are a great time to start. You have time to get into a routine and the kids have more time to earn extra cash around the house and get into some good habits! There’s no golden rule on how much to give, but a nice way to work it out is to decide what you want them to cover with their pocket money – Is it just their football cards or do you want them to cover all their ice-creams on holiday? “Needs” versus “Wants” is another good way – with parents covering their Needs but it’s down to them to cover their Wants. 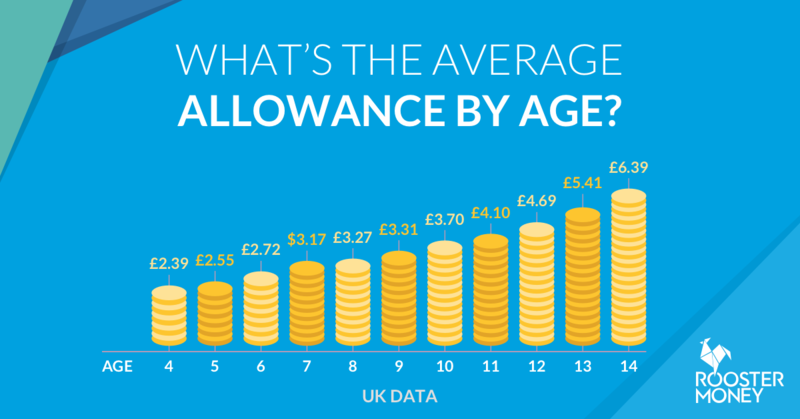 To give you an idea of how much other parents give, you can check our guide on how much pocket money to give here. 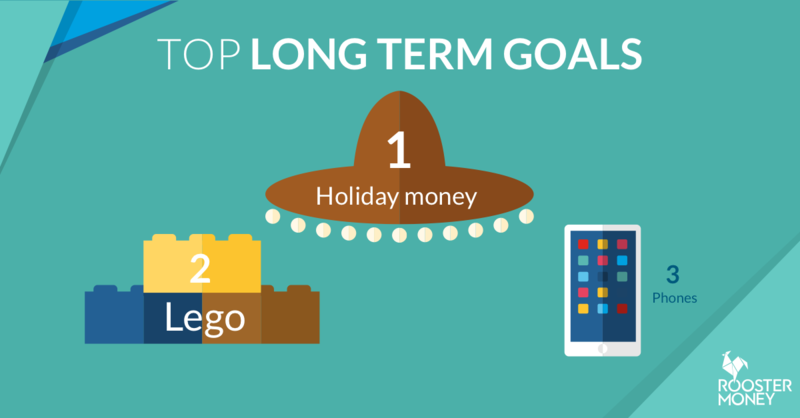 Starting with goals is one of the best ways to teach kids about money. Explaining to kids that you need to put money aside for a rainy day can be tricky, so instead talk to them about what they’d like to save for, by when, and use that as the incentive. Small things like toys and sweets are great, but if it’s bigger things like a tablet you may want to offer to match what they put in, or add 10% at the end of a set period – that could be the day before they go back to school! This is also a good way to teach delayed gratification, and to introduce the concept of interest. Whether it’s a reward chart on the fridge, or an app like RoosterMoney, kids love to see their money grow day by day. Add pictures so they can see what they’re saving for to make it feel more tangible. Being consistent with the rules you’ve set is important to ensure the lessons stick – when you’re in the gift shop at the airport and they’ve spent all their money, don’t undo your hard work by offering to buy them those jumbo Mentos anyway – it’s not a ‘need’ after all! With all that extra time they have, depending on their age, your kids can get a part-time job or take up a few extra chores around the house. 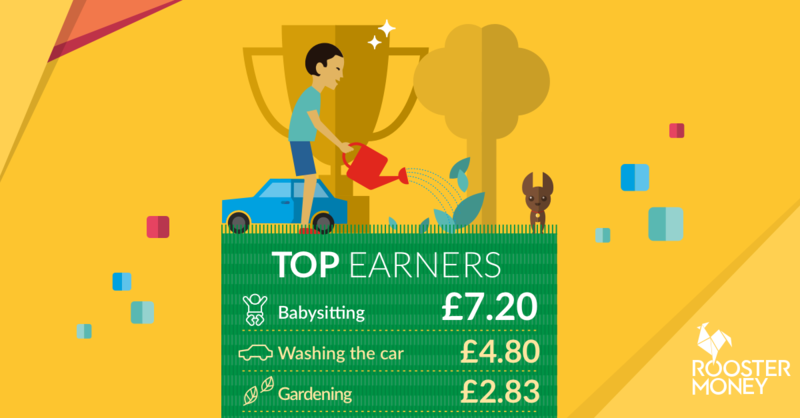 Whether their pocket money is tied to chores or not, there are always bigger jobs like washing the car that can instil a sense of achievement whilst also boosting their savings. Gardening is a great one too, helping watering the plants early in the morning can save you a valuable extra 20 minutes in bed. The great thing about earning money like this means they will also value the things they end up buying more because they’ve worked for them – a valuable lesson in itself. Encourage them to think about the difference between a good and bad purchase by letting them make decisions about what to buy. That doesn’t mean you can’t give them advice on whether one thing is better than another but ultimately, if they make the decision to get something that falls apart the next day on the beach, then they will have learnt a valuable lesson for next time. Over time you should see a shift in how they spend – we’ve seen, of all money added to RoosterMoney last year, 23% was spent on small every day wants – sweets, apps etc., while 77% was put towards bigger goals, whether that was a $200 bike, a holiday trip or just saving. The weekly shop is a great opportunity to get your kids thinking about money. Before you go to the supermarket, explain what you want to buy and what your budget is, and challenge them to find the best value buys, whether it’s peanut butter, cereals or socks for your budget! At some stores, the price of peanut butter can range from 19p to £2.35 per 100g, but can they taste the difference? What’s different about them that makes them better value? Whether it’s a BBQ or a dinner with some of their friends, get them involved from the beginning. Give them your budget, and ask them to list out everything they think they need including napkins, fizzy drinks etc. When you’re at the store let them shop around and see if they can find deals to beat the budget. If they do, why not reward them with a portion of the savings! If you’re thinking of taking some of your family’s stuff to a charity shop, or you just want to have a bit of a clear out this Summer, get your kids involved – both in choosing the things to go (it could be interesting to see what they do and don’t value out of their possessions) and in researching the local charity shop they want to take them to.Learning about how charities use donations can be a great way to get children to focus on the causes that charities support and how effective they are (a whole other lesson too)! Whilst you’re there they can look at the prices of other items around the shop and see what things are worth second-hand. A classic from the archives of ways to teach kids about money, Lemonade Stands are a great educational exercise. From budgeting what it will cost to make up the lemonade, to getting a cash float or accepting payments to working out their pricing for a healthy margin, its financial education in a iced jug. There’s plenty more festivals and events all over the country that you can still take advantage of with their hordes of thirsty visitors. Kids can come up with some wild and wonderful ideas with all that time on their hands over Summer – but don’t dismiss them, indulge their ideas and probe further. If they want to build a big castle in the garden with it’s own ice-cream machine, that’s great, ask them how they would make it? Where would the ice-cream come from? Or how much would they charge for it? Or why not suggest going to a car boot sale. We see a lot of kids on RoosterMoney who are selling items like old toys and clothes. Going through the process of what they’re happy to part with, and how much to price individual items helps them think about the value of their possessions – it can also help you declutter their room! So there you have it, some of our favourite ways to teach kids about money, and ideas that should make learning about money fun too, whilst also keeping them busy this Summer.